Dr. David Nyberg is a radiology specialist in Scottsdale, Arizona and he is working in collaboration with Scottsdale Healthcare Shea Medical Center. He completed the classes of Oregon Health & Science University School of Medicine where he got his medical degree. 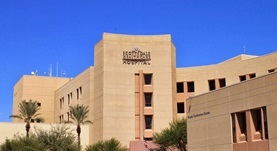 He did a transitional year internship at Maricopa Medical Center. The doctor also did his residency program in radiology at UCSF. He is board certificated in diagnostic radiology, and he has a practical experience of more than 20 years.